Definition: The Marketing Audit refers to the comprehensive, systematic, analysis, evaluation and the interpretation of the business marketing environment, both internal and external, its goals, objectives, strategies, principles to ascertain the areas of problem and opportunities and to recommend a plan of action to enhance the firm’s marketing performance. The marketing audit is generally conducted by a third person, not a member of an organization. The Audit should be Comprehensive, i.e. it should cover all the areas of marketing where the problem persists and do not take a single marketing problem under the consideration. The Audit should be Systematic, i.e. an orderly analysis and evaluation of firm’s micro & macro environment, marketing principles, objectives, strategies and other operations that directly or indirectly influences the firm’s marketing performance. The audit should be Independent; the marketing audit can be conducted in six ways: self-audit, audit from across, audit from above, company auditing office, company task-force audit, and outsider audit.The best audit is the outsider audit; wherein the auditor is the external party to an organization who works independently and is not partial to anyone. 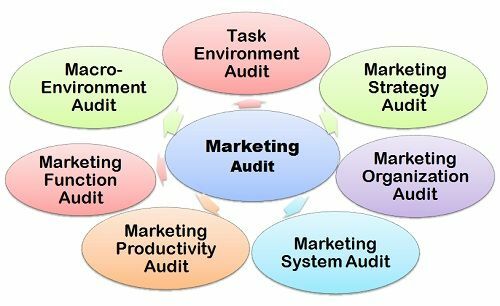 The audit should be Periodical; generally, the companies conduct the marketing audit when some problem arises in the marketing operations. But it is recommended to have a regular marketing audit so that that problem can be rectified at its source. Macro-Environment Audit: It includes all the factors outside the firm that influences the marketing performance. These factors are Demographic, Economic, Environmental, Political, and Cultural. Task Environment Audit: The factors closely associated with the firm such as Markets, Customers, Competitors, Distributors and Retailers, Facilitators and Marketing Firms, Public etc.that affects the efficiency of the marketing programs. Marketing Strategy Audit: Checking the feasibility of Business Mission, Marketing Objectives and Goals and Marketing Strategies that have a direct impact on the firm’s marketing performance. Marketing Organization Audit: Evaluating the performance of staff at different levels of hierarchy. Marketing Systems Audit: Maintaining and updating several marketing systems such as Marketing Information System, Marketing Planning System, Marketing Control System and New-Product Development System. Marketing Productivity Audit: Evaluating the performance of the Marketing activities in terms of Profitability and Cost-Effectiveness. Marketing Function Audit: Keeping a check on firm’s core competencies such as Product, Price, Distribution, Marketing Communication and Sales Force. Thus, the marketing audit helps to determine how well a firm’s marketing department is carrying out the marketing activities. And how much it is adding to the overall performance of the organization.